Tomorrow, the next day, you will still hesitate. And some day you’ll weep over all the lost days. Habit formation, according to Charlotte Mason, is one of the most important duties of a mother to prepare her children for fulfilling God’s purposes in their lives. Instilling proper physical habits allows children to automatically behave appropriately—quickly and without arguing or deliberating. 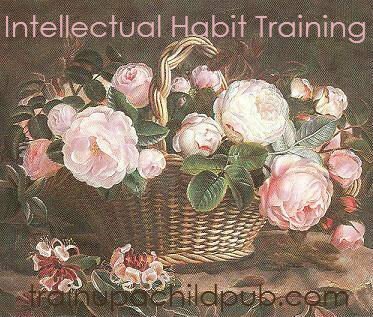 As homeschool parents, not only must we teach children to pick up their socks, brush their teeth and be helpful and alert, we must also do intellectual habit training, which will enable them to use their God-given mental abilities to full capacity. is the foundational habit upon which others are based. Our children must learn to focus their thoughts upon one thing for a time, rather than their minds continually flitting from one idea to the next. Charlotte Mason suggested using high interest, short lessons rather than long ones, and varying the location of the lessons from indoors to out. If a student knows that each lesson is to be a set amount of time and isn’t unbearably lengthy, he learns that he can successfully meet his mother’s expectation of focusing on the material for that length of time. If younger children’s thoughts are wandering, Ms. Mason suggested adjusting the length of the of time of the lesson until you have captured their attention for the entire time. …is the result of providing children with heroic, breathtaking adventures in exotic lands, even in their pleasure reading. Care must be taken to fill their minds with exciting ideas and problems that must take effort to solve. Rather than just explaining gravity, for example, it is best to drop a pebble in the water and let them ponder awhile why it sinks. We do children a disservice by giving them information too quickly. …is Charlotte Mason’s name for full concentration and engagement of children’s minds. Before beginning with today’s reading, recall what happened at the end of yesterday’s. We know today that learning takes place when we connect new facts and ideas with what we already know. We need to help our children make those connections rather than teaching them information in isolation. Connect the new information to the old. Also, teach them to use their powers of observation and concentration by studying nature as well as by picture study. … is “the whole duty of a child.” From infancy, parents should teach their children that obedience is not a choice, but an obligation, every time. Children should obey with a willing spirit because it is the right thing to do, rather than being “bullied” into submission. Charlotte adds that older children should see that making oneself do something that one would rather not do, because it is the right thing to do, is a noble act. …is an absolute standard for children, according to Ms. Mason. This not only includes never willfully telling a falsehood, but also being accurate in relating facts, without generalization or exaggeration for the purpose of generating a humorous response. Repeating a story or rumor without ascertaining it to be true is also unacceptable behavior. …is the last habit mentioned that we must develop in our children. Children are to be taught to be respectful of others and their belongings and to have a cheerful disposition. Charlotte suggested in young children that bad moods be handled most profitably by distraction. Giving an unhappy child a pleasant task to do will help him focus on something else than his momentary unpleasantness. It is our job to teach him to see the bright side of things as well. Although I believe we have a natural bent one way or the other, one can learn to get into the habit of seeing the glass half full rather than half empty. Charlotte Mason believed that all matters relating to children and their upbringing were important, but replacing poor habits in our children with valuable ones through patient, painstaking and loving training and correction is one of the primary roles we must be about in our homes. God’s blessings upon your parenting and homeschooling efforts! Thanks, Helen. There are a number of approaches to teaching these; some general points would be to begin when children are very young and to start with attention and obedience. After you have explained to your child what to expect, patiently instruct until the behavior is correct and PRAISE whenever s/he gets it right. If you are consistent and encouraging, children usually catch on. I think the consistency is key. Thanks for your question; I hope that helps. Wonderful post. Any thought on how exactly to instill all of these? Thank you for commenting, Sydni; glad you enjoyed it! Thank you, Ida Red! I’m not sure why it is so hard to form good habits, but so easy when there is a glitch in the routine to loose them again. Oh well, keeps us on our knees, I guess. Thanks for writing! This is one of the best articles I have read in a long time! I really needed this also. Forming habits is the hardest part for me but I feel inspired! Thanks for taking the time to write this! I’m sorry you had difficulty reading the blog – the writing is very dark gray on a white background. What browser are you using? I looked at it on Firefox and on Internet Explorer and it looked easy to read, so I am at a loss to know what to suggest. Anyone else have any ideas for Shellie? Thanks for taking the time to write, Shellie! Thank you, Sonja; I’m glad you enjoyed the article and please do visit again soon! Thanks for reading and for your VERY kind comments! I found out about this article on twitter this morning and I am so glad I did. This is a great encouragement. I look forward to reading more in the future.